Our 2015 Community Conversation report is now ready, tabulated, and ready for download! WRRC advocates for your LGBTQ interests in Waterloo Region. Join us for our annual community conversation! Come out to our Volunteer Social! 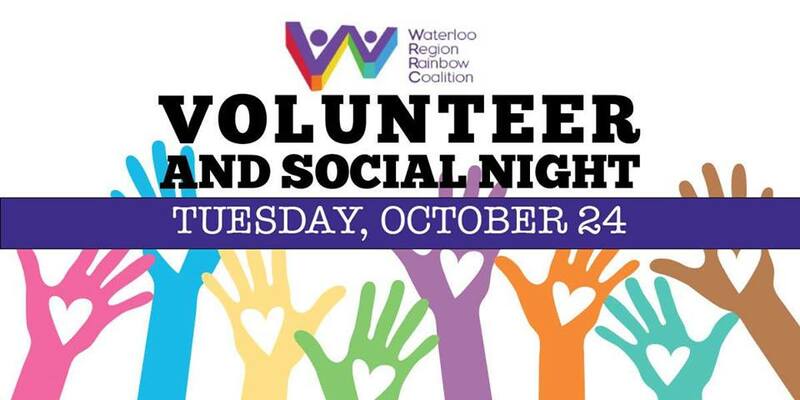 Come out to Symposium to learn more about how to get involved with the Waterloo Region Rainbow Coalition and Queer Night Out. You can meet the board members and current volunteers, have the chance to ask questions and find the perfect role for you! Learn more about who WRRC is and what we do! Read our Community Conversation reports here. See what events are coming up in Waterloo region! Thanks to everyone who came out on Thursday, December 6 to our Naughty or Nice fundraiser at Club Renaissance! Thanks also to Miss Drew for helping organize the fundraiser, and the other drag artists who contributed to this fabulous, fun evening: Victoria Parks, Jasmine Flowers, Dallas Wylde, Felton Bender, and Diesel. We raised $509 through your generosity! THANKS! Thanks to everyone who came out on Thursday, December 6 to our Naughty or Nice fundraiser atClub Renaissance! Thanks also to Miss Drew for helping organize the fundraiser, and the other drag artists who contributed to this fabulous, fun evening: Victoria Parks, Jasmine Flowers, Dallas Wylde, Felton Bender, and Diesel. We raised $509 through your generosity! THANKS!